Ideal for hot weather hunting pursuits, Sitka Gear's Ascent Shirt is lightweight, breathable and quick drying. Form fitting sleeves provide ample string clearance and two mesh backed, zippered chest pockets allow for ventilation and won't interfere with binoculars. Ideal for hot weather hunting pursuits, Sitka Gear &apos;s Ascent Shirt is lightweight, breathable and quick drying. Form fitting sleeves provide ample string clearance and two mesh backed, zippered chest pockets allow for ventilation and won&apos;t interfere with binoculars. 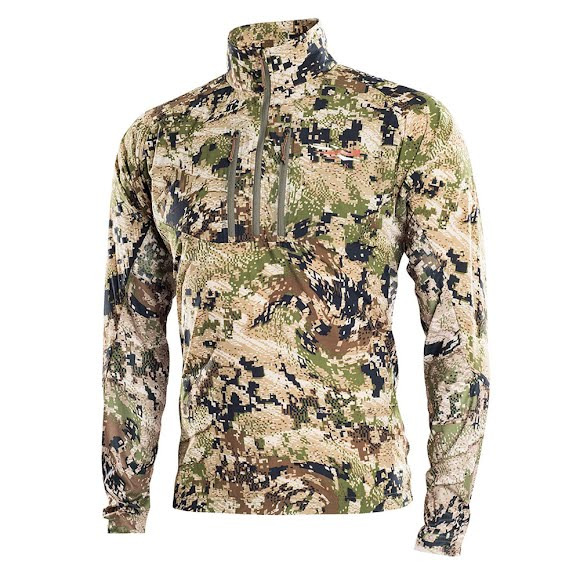 Layering is a science with Sitka&apos;s CORE system of next-to-skin products. Each of the fabric weights-light, mid, and heavy-wicks away moisture to keep you warm and dry, while Polygiene® technology safely and permanently neutralizes odors using naturally antimicrobial silver salt. Build the foundation of your system with a specialized base layer designed to suit your environmental conditions. Sweat is odorless but helps create the perfect environment for odor-causing bacteria to multiply. When sweat mixes with odor-causing bacteria on fabrics, odor results.Polygiene uses naturally occurring silver salt (silver chloride) made from recycled silver, a highly effective antimicrobial agent, to safely inhibit the growth of odor-causing bacteria and fungi. However, Polygiene does not affect the natural bacterial flora of your skin. And without odor-causing bacteria, you stay fresh.